An impressive white pillared monolith with design references to ancient Greek theatres, Wembley Arena is opposite Wembley Stadium. Inside it’s a vast, well equipped concert space with tiered seating for excellent views. Wembley Arena was originally built for the 1934 Empire Games, called the Empire Pool, designed by Arthur Elvin and originally housing a swimming pool! It was last used as a pool for the 1948 Summer Olympics. As the Empire Pool, it was host to the yearly New Musical Express Poll Winners' concert through the 1960s, winning a name for musical innovation with audiences of 10,000 enjoying bands like the Beatles, Cliff Richard and The Shadows, The Rolling Stones, Rod Stewart, The Who and more, in a show hosted by Jimmy Savile and Pete Murray. Sir Cliff Richard has sold out at the venue numerous times. headlining 63 shows between 1984 and 2009. Today this amazing building is one of the world’s premier music, comedy, sport and family entertainment venue, renovated at the same time as Wembley Stadium at a cost of £35m back in 2006. It re-opened under its new guise with a gig by superstar band Depeche Mode. The Masters Snooker tournament is held at Wembley Arena every January, and it’s a popular venue for boxing, wrestling and ice hockey. The venue’s Square of Fame, in front of the arena, is rather like the Hollywood Walk of Fame, with bronze plaques including celebrity hand prints set into the pavement. The first celebrity to join in was Madonna, in 2006. An impressive 12,500 seats make Wembley Arena the second biggest indoor arena in London and over the years it has seen performances by every big name you can imagine. The Wembley Arena roll of honour includes Cliff Richard, Madonna, Kylie, Dolly Parton, Status Quo, Prince, Pink, Bob Dylan, ELO, Pearl Jam, Lionel Richie, Christina Aguilera and Westlife. Sporting events at the venue have included Masters Snooker, MMA, boxing, hockey, World Wrestling Federation events and the Horse of the Year show. If it’s big, it’ll probably appear at the Arena! Wembley Arena has a dedicated booking line for disabled customers. For all enquiries, or to book Wembley Arena tickets, call 020 8782 5629. 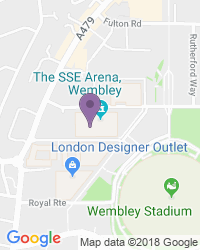 We’re your top destination for a wide variety of seat types and prices, with excellent availability on the full range of Wembley Arena tickets.